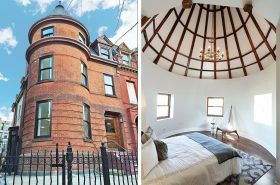 A home with an incredible, well-documented history has a unit up for rent inside its turret. The townhouse in question is 1372 Dean Street in Crown Heights. The castle-like, three-story Romanesque Revival brick residence was built in 1888 for $8,000 with a slate-shingled turret. A few years back, its seller was featured in the New York Times–she had bought the property in 1983 for $66,000 and then sold it to an investor for $1.32 million in 2013. It has since been converted to rental apartments.